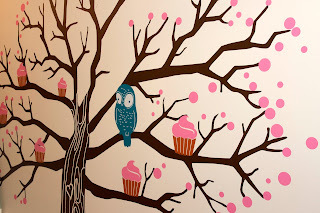 While walking towards the Lower East Side to do a little shopping, my friend LoFo and I stumbled upon this bakery! I just couldn't resist that neon sign. We stopped in to see what their gluten free options were. They didn't have much on the menu, but they did offer up gluten free brownies. How could I say no? It was my birthmonth after all. Unfortunately... it wasn't very good. I took a few bites and tossed it soon after. It didn't have great chocolate flavor, was pretty crumbly and altogether dry. I would go back to Pinisi to see if they have any other good gluten free treats. I'm always willing to give it another go! Despite not being the best gluten free brownie I've had, I liked the atmosphere of Pinisi. It seems like a great place to spend a Sunday with a large cup of coffee or tea and a good book. When I was in New York City with my friend LoFo we stopped by Pie by the Pound. I thought I had been here once before... but upon actually eating here, I don't remember having been here. I ordered a veggie pizza with asparagus, yellow peppers, red peppers, and lemon. I enjoyed the unique flavors that the restaurant offers to place on top of a pretty bland gluten free crust. The crust tasted like a plain, thin rice crust with little flavor. While Pie by the Pound does offer unique toppings on its pizza, it didn't quite make up for the crust's plain flavor. Pie by the Pound is definitely no Mozzarelli's; if I'm in New York and am craving gluten free pizza, I'll definitely hit up Mozzarelli's before returning to Pie by the Pound. The gluten free pizza at Pie by the Pound takes longer to cook than the regular pizza and was also expensive -- $17.00 for the size you see above! I am also unsure as to whether the pizza was put in a gluten free oven, but I didn't feel so hot after eating this pizza. Maybe it was a fluke, but I feel it's appropriate to warn you readers. Introducing Gluten Free Lemon Cupcakes! The frosting is very thick -- it tastes similar to a light ice cream, it's that thick. This is definitely not a cupcake you can eat with your hands! 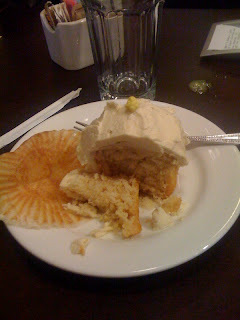 I like the Lemon Cupcake; it might not be my favorite gluten free cupcake but it's a unique taste at a great price (usually less than $3). On our first day in New York, LoFo and I met up with her friend Samantha in the Meatpacking District. It was a nice day in the city so we took advantage by walking around and exploring; it was only Lauren's second time in the city so I tried to get us walking as much as possible... particularly because of the absurd amount of driving we do in Los Angeles. On that first day we ended up back at Samantha's apartment in the West Village. She lives on practically the same block as Magnolia and there was no way I was going to let LoFo leave New York without tasting the amazing, wondrous experience that is Magnolia. Of course, I've never tasted the wonder on my own... but I've heard tales. The picture to the right is LoFo and I outside of Magnolia in New York's West Village. While the girls waited in the line that wrapped around the block I meandered into local boutiques. Having already been shopping all day I tired of that easily and sauntered back to the inordinately large line -- I'm glad Babycakes never has such a wait! I came back to the line at the perfect time, as the girls were just about to enter into the shop. The delicious smell of gluten assaulted me... and I almost gave in. Readers please don't think less of me! I swear I have never voluntarily eaten gluten having been a Celiac for almost 5 years. But those cupcakes smell so good! Don't worry, don't worry, LoFo held me back -- we had a very busy New York itinerary and there was no time to be ill. However, when I started talking with one of the women behind the counter, she told me about the shop's flourless chocolate cakes. I asked her what was in them and she said what I imagined she would say: eggs, sugar, chocolate. "That's it?" I asked. "That's it." She replied. She warned me that if I had a deathly severe allergy I should steer clear as it was not prepared in an allergen free environment. Again, readers, please don't think less of me; my birthday was fast approaching and I was so hungry for a real Magnolia experience (despite having earlier gone to Tu-Lu's Gluten Free Bakery)... I broke down and ordered it. Fortunately I had no bad reaction! However, again, please use your own judgment when ordering this as it is not prepared in a gluten free environment and cross contamination is a definite possibility. I was rewarded with a good chocolate flourless cake but not a great one. Honestly for the risk... it wasn't worth it. But I thought I should still inform risky people like myself that options do exist if you are dragged to Magnolia against your best gluten free judgments. If you're a regular reader of this blog you're probably already doing this challenge (by eating gluten free), but this is a great idea to pass along to your loved ones or the curious friend who asks "Really, how hard is it to eat gluten free?" WHAT: To raise awareness for Celiac Disease (a digestive disease that can lead to malnutrition if not treated) as well as more expansive gluten intolerance, the public is invited to participate in a Gluten-free Challenge--to eat one gluten-free thing a day for a month and on the final weekend, eat completely gluten-free for one weekend. Celiac Disease affects 1 in 100 Americans. The only cure is to adhere to a gluten-free diet. The goal of the Gluten-free Challenge is to bring family and friends to the dinner table to see that you can still enjoy a delicious and satisfying meal as a family--whether it be a regular meal or a holiday event. The Challenge will also empower people to learn more about this easily treatable disease and help bring awareness to the choices faced by those who adhere to a Gluten-free diet face. 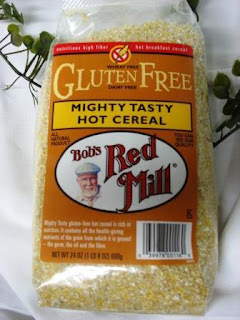 Two of my friends, Martha and Rochelle, recently asked me how hard it is to go gluten free. For Martha it seemed to present a problem -- she loves her english muffins and, as she lives in D.C., I couldn't recommend an adequate substitute. Rochelle on the other hand has found it much easier to adjust to the gluten free diet. Perhaps it is because Rochelle lives in Los Angeles and eating gluten free is simpler here (everybody here has weird eating issues) or it may be that Rochelle is not as attuned as we Celiacs are to every hidden source of gluten. I only mention the latter since she won't get sick from a little gluten; that's a dead giveaway for us that we've had some. Wouldn't life be easier if we could eat whatever we wanted? Anyway, this challenge is a great way to share your eating lifestyle with your family and friends. This post is way overdue, apologies! A few weeks ago I drew the lucky winner -- Sarah! iHerb was so gracious in giving myself and a reader each $50 to spend in their online store. I'm happy for you to share which products I ordered from iHerb. My selections included: spirulina, chia seeds, raw cacao, Bob's Red Mill GF Hot Cereal and Polenta, and coconut Oil. I found the process to be pretty easy. iHerb.com had so many products to choose from and I spent a good amount of time selecting my items. It is definitely helpful if you have an idea of the things you are looking for on the site. The staff at iHerb were helpful and prompt in their communication. When my package arrived, my container of chia seeds had a broken seal and half of the container had spilled out into the ziploc bag it was packaged in, along with a couple of other items. I immediately contacted customer service regarding the problem. They responded back almost immediately and are sending a replacement (which has yet to arrive - hopefully in tact this time! ), which has already been shipped. Most of the items were mailed in a ziploc bag either by themselves or with one other item, which in the case of the broken chia seed container, spared the box from being covered in them! Great news -- zPizza is offering my readers a $20 giveaway! There are very few restrictions: you must be over 18 year of age and a U.S. resident. Of course, you may want to know why you should enter. ZPizza is great, organic, and gluten free pizza with locations all over L.A. (and the country). For ZPizza's locations, click here. Check out my previous posts on ZPizza here, and my post about the chain's ZBites here. If you pass that low bar, feel free to enter. Here's the deal: leave a comment on this post letting me know which zPizza flavor is your favorite! That's it. Super simple. Check out all of the great flavors here. Also, be sure to leave some form of contact information (i.e. e-mail address) so I can reach out to you if you are selected as the winner! This contest will run until April 5th, 2010 at 5pm. If you aren't selected as the winner don't fret: zPizza has a lot of great deals available. Check them out on Twitter here and became a fan on Facebook here. I've been meaning to check out Caracas Arepa Bar for a long time and now that my friend's Elien, Fich, and Floor live in Brooklyn, I figured there was no better time to finally see what Caracas was all about. We were lucky enough to get a private table in the back of the restaurant's Brooklyn location, located near the Bedford Street stop on the L train -- again, perfect since Lauren and I were staying in the East Village by the L train. When we sat down we were handed drink and food menus. Our hostess was very helpful and I made sure to mention that I was eating gluten free. Both she and our waiter were extremely helpful in guiding me in my selections; they told me that basically all the arepas on the menu was fine as long as I ordered it without fried plaintains. It was also simple to order drinks as most of the restaurant's drinks were rum based! I have tweeted to my followers about gluten free hard alcohols and have been told that all distilled alcohols are fine. However, I stick with rum and tequila because of bad experiences with vodka and other hard alcohols. I went with an order of the De Guasacaca, which came with guacamole and cheese. I really wish the photo I took came out well, becuase this arepa was pure heaven. Unfortunately it is horribly dark and not even worth posting here. 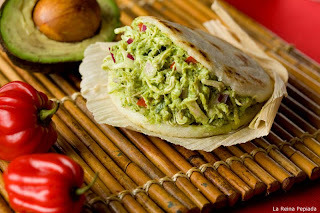 For some great pictures and a description of arepas, check out the restaurant's description here. I've taken one picture from the restaurant's site below. Regardless, I'm a huge guacamole fan now that I live in California, having never been a particularly big fan before moving to Cali. The arepa itself tasted great; it had a light crunch to it somewhat similar to a soft sandwich bread. 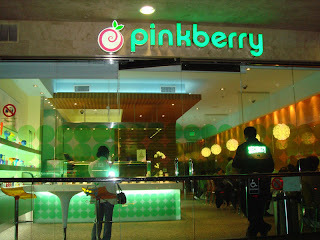 I will definitely be going back to Caracas next time I am in New York City. I've heard that the restaurant's East Village location is smaller and I'm excited to check it out! Big news! King Arthur will soon release a line of gluten free mixes. 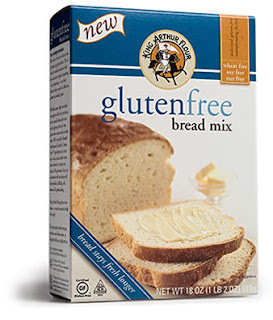 With Betty Crocker already offering delicious gluten free mixes, this is just another sign that gluten free is no longer just a buzzword; it is taking on a life of its own thus making the gluten free diet much more manageable. King Arthur will soon release its mixes, including mixes for bread, chocolate cake, cookies, brownies, pizza, pancakes, muffins, and a general gluten free flour. The website currently offers the mixes for sale and says that they will soon be available in stores. I finally checked out Flore this past Friday; my friend had suggested the restaurant to me a long time ago but we had never been able to visit. Luckily my friends Rochelle and Anna, along with Anna's sister Lauren, were able to sit down for lunch and finally indulge in Flore Vegan's menu. My friend recommended the restaurant because it marks many items gluten free. It's always great to have such an easy time choosing and not worrying about hidden ingredients. Flore Vegan is in Sunset Junction, a great (and super walkable) area of L.A. that has a lot of unique offerings. It's a great area for people watching and to pick up interesting trinkets. I opted for the Portobello Tacos and was pleasantly surprised by the portions at Flore; I certainly was not going to leave this meal hungry. I particularly enjoyed the taste of the Portobello mushrooms in this dish; they were prepared in a very flavorful sauce and definitely made the meal better. 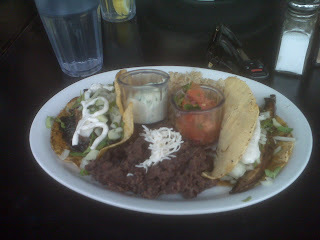 However the black beans and rice were disappointing, particularly in comparison to Real Food Daily's. It didn't help that they were served cold. While I did enjoy the flavor of the portobello mushrooms, the tacos were cumbersome and practically impossible to eat with my hands because of their size. I found myself separating the foods in the taco because I wasn't able to eat them altogether, and I think the flavor suffered as a result. I can't say I loved Flore. I'm glad I checked it out, and it's a terrific option for gluten free vegans that live in the area, but I don't think I would make the trek again with Real Food Daily and Hugo's so close. I did enjoy the restaurant's outdoor seating, however, which makes it a perfect people watching place.